Republican members of Congress and D.C.-area students kicked off National School Choice Week with a more subdued event than in recent years, as federal school choice efforts face increased headwinds from the new Democratic House majority. 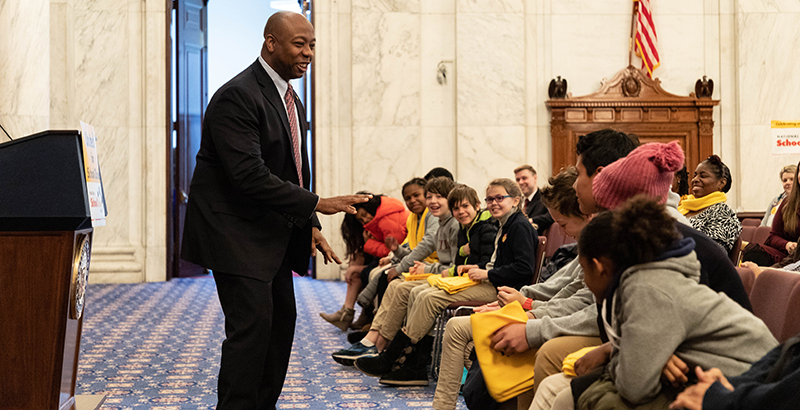 Sen. Tim Scott, Republican of South Carolina and one of the co-chairs of the congressional School Choice Caucus, celebrated what he said was the success of school choice in the nation’s capital, which includes a robust charter sector that educates almost half of students, and a federally funded private school choice program. “The power of school choice is undeniable in D.C. and, frankly, around the country,” Scott said. The biggest victories for school choice proponents in the last session of Congress, during which Republicans controlled both branches of the legislature and the presidency, came in the form of increased funding for the federal Charter School Program and a change to tax law that will allow families to pay for private K-12 tuition with certain tax-advantaged savings accounts. Though advocates are optimistic about the possibility for continued increases for the charter program, other priorities, such as education savings accounts for military families or a federal tax credit scholarship, are less likely to see movement given the current makeup of the House. Rep. Joe Wilson, Republican of South Carolina, touted his “Military Child Education Freedom Act,” which would permit military families to use Coverdell accounts, which allow for pre-tax savings for some K-12 education expenses, to cover homeschool materials. Wilson’s oldest son is a doctor in the Navy, and his grandchildren have hopped among public and private schools in several countries and have been homeschooled for periods in between. The press conference was smaller than in recent years. Lingering snow kept several schools away, organizers said. Last year, members celebrated the federal tax overhaul, and in 2017, Republican members used the event to defend the then-pending nomination of Betsy DeVos to be education secretary. Rep. Paul Mitchell, the other co-chair of the School Choice Caucus, encouraged families to talk about the successes their children have achieved through school choice to help break through the hostile politics that often surrounds the issue. In his own family, for instance, his teenage daughter has found a virtual school to be a better fit, while a son, who has learning disabilities, is homeschooled.